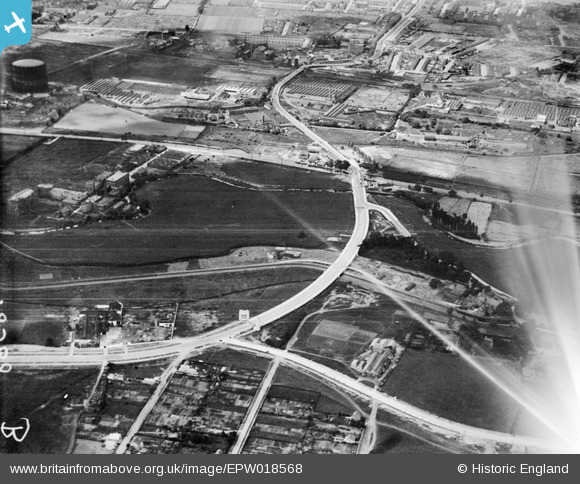 Where best to start with this highly useful set of images showing the creation of the A406 North Circular Road? The roads at the bottom are from L>R Westward Road & Sinclair Road. From the right the road joining is Hall Lane with the Cork Factory just beginning to be developed, further to the lower right is Chingford Pumping Station(now being squatted!) with the white highway behind it & better viewed in other images, is Lower Hall Lane. Worthy of note in that location is the small bridge which carries that road over a small stream, has fixed to one side of the parapet an ancient highway notice regarding weight limit of 'Locomotives' ie steam powered vehicles. Nobody has yet pinched that artifact! I will try to load up an image of that soon. As the road heads off in the distance (west) it crosses the River Lea centre of image, to the right at that point now is the Edmonton Incineration Plant. 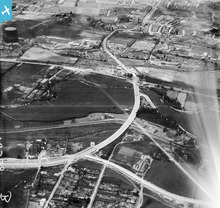 Beyond that and still on the right are factory sheds in abundance, whilst on the left is the Willoughby Road gasworks. Then the road climbs upwards and over the Hertford railway line (Angel Road Station just detectable to the right of the road). Sadly it is too far distant to pick out the railway sidings alongside Montagu Road and the place a little way further along that happened to be the birthplace of Bruce Forsyth Johnson (Sir Bruce Forsyth). I was recently informed by an elderly neighbour, at a time when the abutments at Cooks Ferry(they don't yet show up in these 1927 images) were being demolished for a roundabout (2003), that one of them carried an inscription picked out in the brickwork mentioning the construction date & architect? I hope someone might have taken a photograph at some time & load it up here.